Premium brand Bridgestone has announced it will stop producing its famous Dueler A/T 694. But, the new Dueler A/T 001 will ensure its replacement! Incorporating the tyre manufacturer’s own advanced technologies, this new tyre is built to equip 4x4 vehicles such as the Land Rover Defender, the Jeep Wrangler or even the Toyota Hilux, and this in all seasons and on all types of surfaces. Drivers of 4-wheel drive vehicles who particularly enjoy venturing off the beaten track will surely appreciate the driving pleasure the Dueler A/T 001 offers in all-terrain mode. Bridgestone has designed this tyre for drivers who spend most of their time driving on-road than off-road. 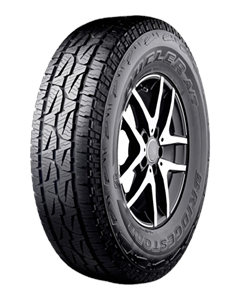 Thanks to its tread block geometry and the strength of compounds, the Dueler A/T 001 offers better performance than its predecessor, the Dueler A/T 694, with better traction adapted to all types of terrains (dusty roads, muddy trails and snow-covered paths) and increased longevity for a more durable tyre. The innovative design of lugs and grooves increases the tyre’s contact patch to provide a high level of stability when braking on wet roads. Still for on-road driving, the latest Bridgestone is designed to deliver responsive handling as well as a smoother and quieter ride.